Many police dogs have tough-sounding names, or names that mean something in the law enforcement world, such as Copper, Bomber, Fang or Diablo. 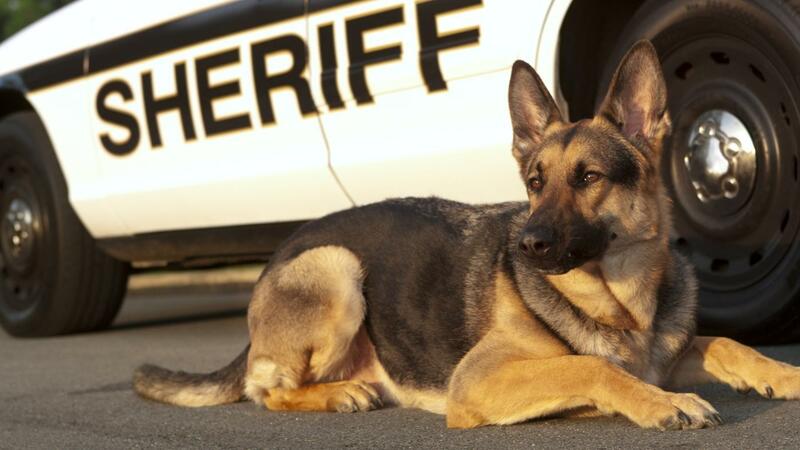 Other police dogs are given more innocuous names that belie their strength, speed and power, such as Dallas or Larry. Tough police dog names are meant to strike fear in the hearts of prisoners or criminals on the streets. Names such as Kujo, from Stephen King's famous book, are culturally synonymous with a vicious, dangerous animal. Bomber, Fang, Evil, Hannibal and Diablo fit into this category. Other officers choose to name their K9 partners names that relate to the nature of the law enforcement world. Copper plays on the slang term used for officers, while Bullet and Talon allude to weapons and ammunition used by officers. These names often symbolize the dog's role as part of the K9 team. Some officers give their police dogs names that make the animals seem harmless or delicate. Some choose these names as a humorous way to acknowledge the power, strength and deadly force their dogs possess. Others, such as officers who may bring their dogs to schools as a teaching tool, choose names that aren't so tough to avoid scaring kids. These names include Dallas, Frieda, Larry, Bradley and Fawn. What Does "DEA" Stand For?